Heat oven to 180°C/160 fan/gas 4. Sift in the flour and cocoa powder and mix until well combined. Place 12 cupcake cases in to a cupcake tin and spoon the mixture evenly in to all cases. Bake for 15-20 minutes until a thin skewer inserted into the centre of the cupcake comes out clean. Allow to cool for 1 hour. Whisk both icing sugar and butter together, once whisked add the milk to loosen the icing slightly. Set aside for piping. In a hot pan melt a knob of butter adding the blackberries and icing powder. Bring to the boil and flambé with the crème de cassis, allowing to reduce slightly. Cool and set aside. 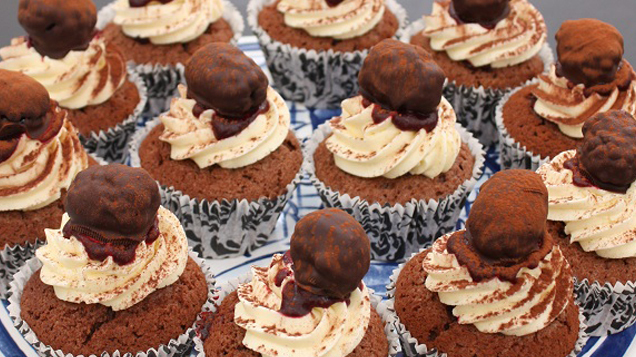 With a sharp knife cut out the top of the cup cakes and drizzle with some Crème de Cassis. Insert a blackberry with some sauce in to each cupcake. Pipe the butter cream icing on to each cupcake. Melt your chocolate over a saucepan of boiling water. Pipe the chocolate over each cupcake.